My friend Nick George is President of the Midwest Food Processors Association. 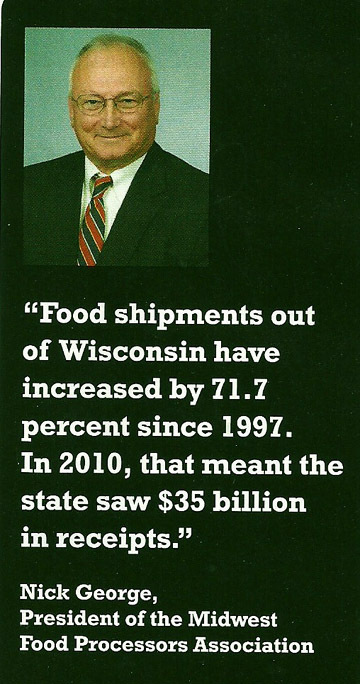 Nick is featured in an article entitled 'Food for the World' in the May issue of Corporate Report Wisconsin. "But mankind does not live by cheese alone. While the dairy industry accounted for state exports of $231 million in 2011 (up from $213 million the year before), it is only the fourth largest food category export for Wisconsin. Cereal grains lead the way doing $380 million in business and beverages came in second with $318 million — not counting ethanol. Miscellaneous foods such as soups, sauces and the like are third with a $249 million export value in 2011, dairy is fourth and fifth is baking-related items (mixes and dough), reporting a value of $226 million." "Food shipments out of Wisconsin have increased by 71.7 percent since 1997, according to the Midwest Food Processors Association. In 2010, that meant the state saw $35 billion in receipts." "'It’s amazing what comes out of this state,' says Nick George, president of the processors association. 'I think the food industry everywhere just doesn’t get the credit it deserves.'" "Wisconsin, he adds, is second in the nation behind California for total value of processed vegetable crops." "George says Wisconsin food producers have a strong work ethic working in their favor. Regardless of the constant changes in the industry, the world knows the resourcefulness and resilience of the American Midwesterner." 'The challenges are amazing, but the industry adapts and keeps moving forward,' says George." Thanks Nick and Corporate Report Wisconsin and to DATCP Secretary Ben Brancel for a great look at Wisconsin agriculture and regional business opportunities. What jumps out at me is that specialty foods, such as soups and sauces, are ahead of dairy in total exports from Wisconsin. Amazing. 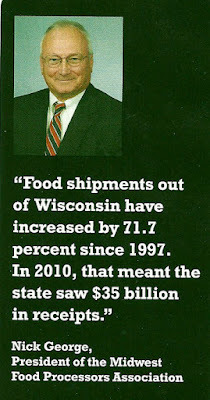 Food processing facilities like the wonderful Wisconsin Innovation Kitchen can grow this story in many good directions. As we say in Wisconsin... Forward! Food For the World. Corporate Report Wisconsin. May 2012. By Jen Bradley. Photo and quotes - credit Corporate Report Wisconsin. Thank you CRW.